So back in 2008 I was unemployed and itching for a project. Why not blog my thoughts? That will take up some time… Never in a million years did I dream that 4 years later and 500 posts I’d still be at it blogging, sharing, writing, and becoming the best version of myself. I think in the end a lot of the satisfaction of blogging goes back to my faith (as everything does for me). In my church we believe that through testifying, a person grows in testimony. Through sharing your life story and convictions with another they become deeper, you become better, along with the other person. I think that is the main reason why Mormon’s make such good bloggers. They fundamentally believe, like me, that sharing makes you stronger and more Christlike. It is perhaps the greatest thing we can do for ourselves and the world. I certainly saw that on my mission. Why some may look at my service as an unselfish 20 months (which I tried to make it be) but really it was an incredibly intense personal experience of growth. There is something about allowing yourself to be vulnerable that builds everyone else. This is true in any kind of sharing, even when it is a silly recipe or joke. Also, another facet of my faith is the importance of remembering each soul. We believe that every soul must be baptized and that no individual is denied that choice. This is why we do family history or genealogy to find out who came before us and if we can do the work for them, then give them that option to accept. But its more than that, my faith also teaches that each person should make a chronicle of their life. That journaling and sharing your oral history with those you love is as vital if not more important than the covenant work done for the dead. This includes every person no matter the mistakes, marital status or position in the church. I’ve kept a journal since I was 8 years old and I treasure every one of them because they are the portrait of my life. How great is it to be able to share that portrait with all of you? I feel so blessed. In any other era I would be a lonely girl who probably lived with her parents because it was socially unacceptable to live alone. I would be stilted and stifled but today I have a voice and 100-250 people a day click on posts and many (if not as many as I might like) make comments and start discussions. It is a blessed age. Mostly I’m just grateful that I learned the value of open book living. That people from all over the world know my story. If I die tomorrow there will be many who can say they knew me and that is powerful. In some ways it is appropriate that I started the blog when I was unemployed because that was my greatest leap of faith. It was perhaps only then that I was ready to share the whole me with the world. I will never regret taking that leap and involving all of you in it. Best choice I ever made. Thanks friends! There are so many others. I honestly feel an attachment to every last post. My sister is always joking that every couple of days I say ‘have you read my blog. I really like this one’. But its true. Maybe it says something about my ego but I think they are all great! I look forward to 500 more and writing my novel in a month next month. Wahoo! 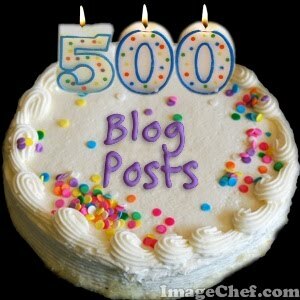 It seems like everyone does a prize for a 500th blog. So here goes. Will send a prize to the first 5 comments on this blog. Wow!! What an accomplishment! Good job! Thanks so much for reading them. Its interesting because neither of my parents keep a journal so I’m not sure where I picked it up from. I think part of it was from an early age I was bullied and felt misunderstood. Sometimes the only one who understood me was myself and God. (Everyone feels that way as a teen right?). Anyway, thanks for reading! 500 more for sure! Thanks you guys. That’s 5! (I should offer prizes more often). 🙂 Since I know all of you email me your addresses and I will send it your way. smilingldsgirl@yahoo.com. Congrats on 500 posts. That is truly something to be proud of.